My family records in Scotland date back as far as the 16th century and show that my breed was developed by crossing collies with Polish Lowland sheepdogs. My early relatives worked as sheep dogs, helping the sheep herders keep track of their wandering sheep. I'm rather easy-going and I like people. I can be a little on the rambunctious side at times, but I make a good family pet if you have room for me to get enough exercise. My coat does need brushing regularly to keep it from matting, but it doesn't need any elaborate grooming or fancy clipping talents. When fully grown, I am between 20 and 22 inches tall (50.8 to 55.9 centimeters) and I weigh between 40 and 60 pounds (18 to 27 kilograms). We have no Bearded Collie Breeders listed at this time. 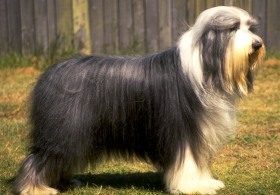 Click here to place your Bearded Collie Ad!